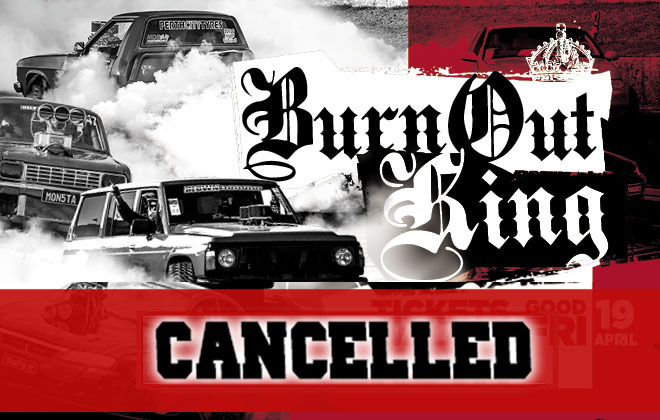 Good Friday Burnout King cancelled! The weather forecast, confirmed this afternoon, indicates that Good Friday will be wet. As such, we have made the difficult decision to cancel the event. We thank all our supporters for your patience whilst we awaited confirmation of the forecast. All entrants and ticket holders will be provided with full refunds, noting that the public holidays over the next week may slow the process slightly. Thanks again, and we look forward to seeing you all at UBC on the 11th of May at Perth Motorplex. Friday April 19th is a date not to be missed you better lock this event in! GOOD FRIDAY BURNOUT KING IS COMING! See all the stars of the Snakepit frying the tyres and shooting for that prestigious win, only way to watch this is by being at the Perth Motorplex! It’s going to be another full on smoke fest across both the Pro, Open and the new Sportsman classes you’ll need to be there to cheer on your favourite. We’ll start sending cars across the burnout pad at 5:30pm so get there early and claim your spot for a ballistic night of burnouts! Here’s some of the action you might see on the night! Early Arrivals can park in 3A Car Park and enter on foot through Competitor Entrance from 1:00pm.